John Deere has launched the brand new A40 and V40 PrecisionCore pedestrian aerators for golf greens and other fine turf areas. Based on extensive customer feedback, and replacing the previous Aercore 800 model, these latest machines have been designed from the ground up to provide increased productivity and efficiency compared to traditional aerators on the market. A patented articulating frame delivers more consistent hole depth on undulating terrain, and operators can now change hole spacing on the move. The aerators also feature a tighter turning circle, for sharper, quicker turns, and are available with an optional verticutter attachment for aerating and verticutting the turf in one pass. 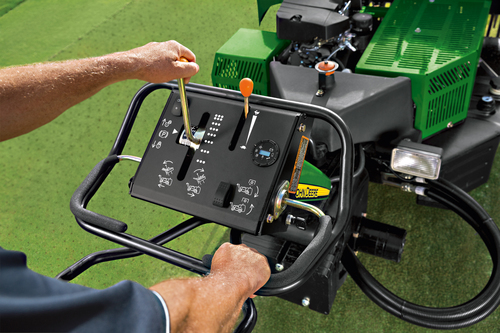 A redesigned operator station provides easier control of the machines, as well as reduced levels of handlebar vibration. To match the performance standards of these new aerators, John Deere has also launched a range of top quality Precision Tines for use on greens, tees, fairways and roughs. Available in a choice of Precision Standard, Precision Plus and Precision Ultra designs, these durable new tines have been engineered with fine detail and accuracy to allow greenkeepers and groundsmen to customise their aeration technique based on the needs of their individual course and different soil conditions. All of the solid tines in the range start as a single raw solid alloy rod, which are then machined for precision, increased strength and durability. The hollow top and side eject tines start out as hollow alloy tubes and are specially formed to provide a smoother interior and exterior surface for easier ground penetration and less risk of blocking.